It’s hard to believe but Amelia turned three the other day! Memere and Buppa made the trip down to celebrate with us and we threw a big party to celebrate. Of course, everything was Thomas themed, from the cake to the balloons to 90% of the bagillion presents Amelia received. We all had a blast, especially Amelia. We were so proud of how she thanked each and every person who gave her a present…”THANK YOU VERY MUCH!”. 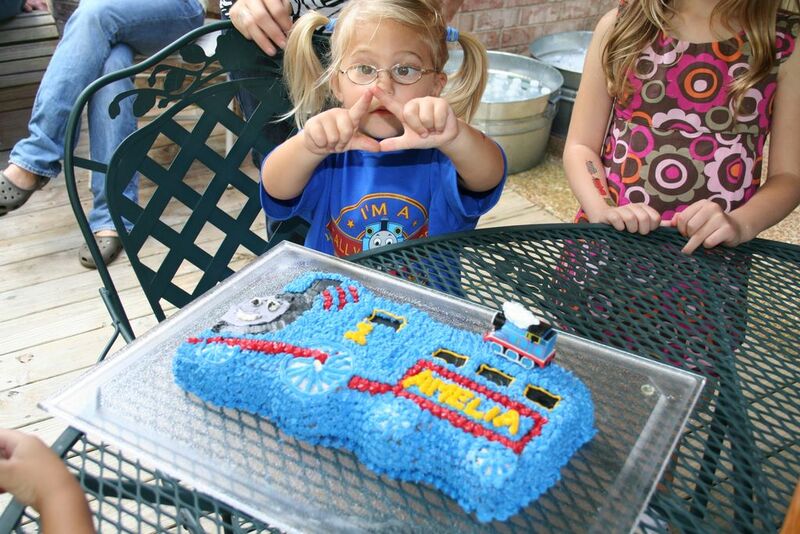 She loved her Thomas cake that Memere helped us make. We kept it a surprise until it was time to blow out the candles and her face just lit up when she saw it! The kids all had a blast pinning the “1” on Thomas, painting trains, coloring Thomas, decorating cookies and gathering the spoils from the pinata. Amelia’s 3rd Birthday Party from Mike Rustici on Vimeo. Somebody got the idea to take 7 kids to a cabin in Gatlinburg for the weekend and hit Dollywood. It actually turned out to be a blast. 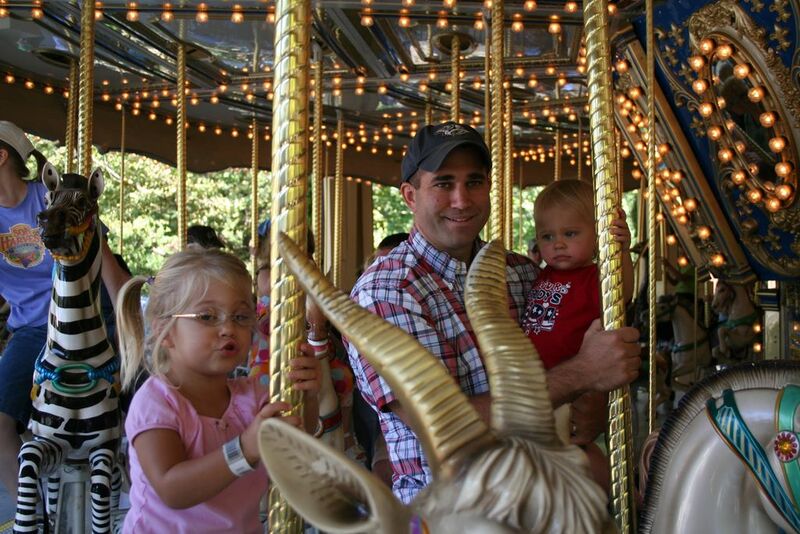 Dollywood wasn’t nearly as redneck as I imagined it to be and the cabin we found rocked (for the adults especially). The kids had a blast with each other and on the rides. 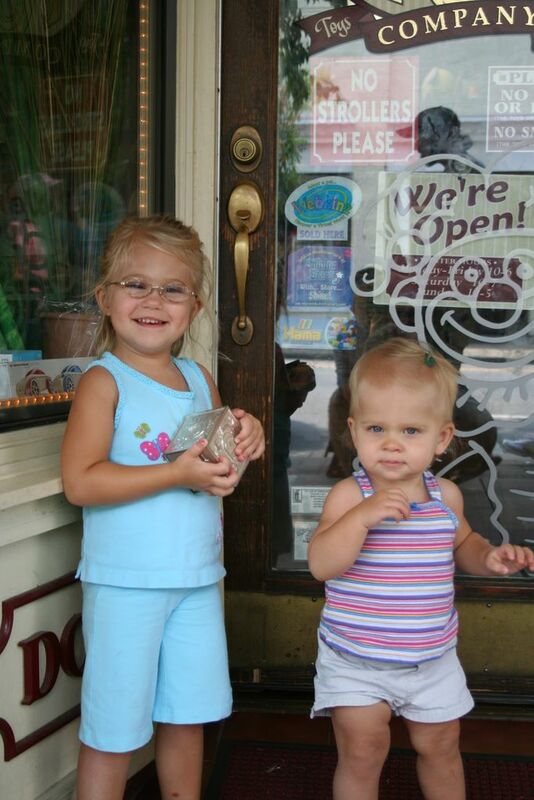 The little car ride was Amelia’s favorite, but she fell in love with Katie the train…a real live steam engine! 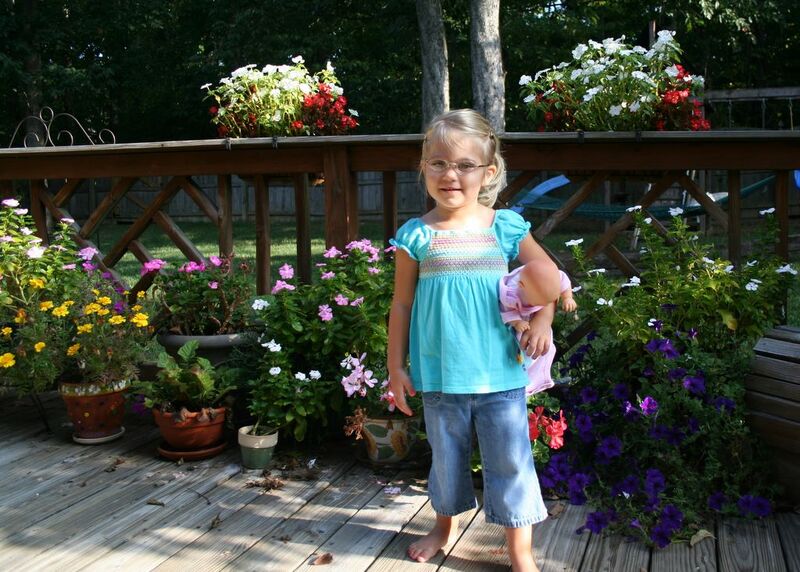 Amelia started at a new preschool this fall. She’s at the YMCA Preschool right around the corner from our house. We were lucky to get into this great program when we called on the very last day they were accepting applications for the lottery. We had heard great things about the program so we felt very lucky and blessed to have been accepted. Amelia loves all her new friends (she can name 8 out of 10 of them already) and of course loves her new teachers, Miss Lauren and Miss Brenda. 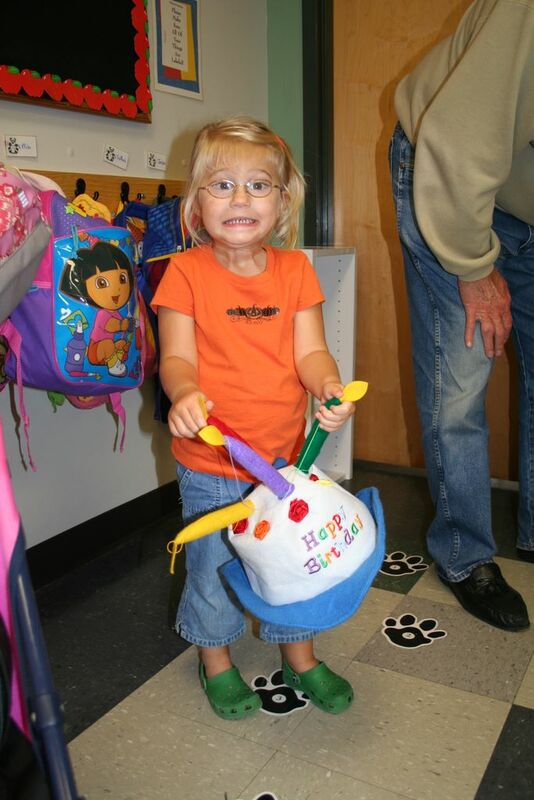 She had one day or so of not wanting to go, but as soon as she gets in the classroom she lights up and has a blast. The teachers rave about her and she loves to bring home her daily artwork. After a few weeks of getting settled in, the kids had their first school “event”. Part sporting event, part fund raiser, all the kids brought their tricycles into school and had a “trike-a-thon” to raise money for St Jude’s Children’s Hospital. Amelia did great! She was nervous about it going in and up to that morning we didn’t think she’d be willing to do it. But, when the time came, she got right out there and was the fastest little rider in her class! In October for Fire Safety Week, the local fire department paid their class a visit. A fireman came into the classroom and taught them all about his uniform. They all got fireman hats, stickers, and a tour of the fire engine! It was what they call an “in house” field trip! Amelia’s Trike-a-thon from Mike Rustici on Vimeo. It’s been a year since our innocent excursion to Thomas Day 2007 triggered Amelia’s infatuation with this oh so cheeky little engine. In that time, trains have come to dominate our lives and our house! Nashville’s Day Out With Thomas is now the must attend event of the year. I wonder if she’ll still be this fanatical in 2009? Day Out With Thomas 2008 from Mike Rustici on Vimeo. Back in July Amelia started to be curious about money. We explained the basics to her and gave her some “chores” she could do to earn some of her very own money. Whenever she feels like working, she can get the mail/paper or help water the flowers to earn a bit of spare change. For a while, she was really in to it and reliably did her chores day after day. By August she saved up $10, so we took her to the toy store to buy a new Thomas train. 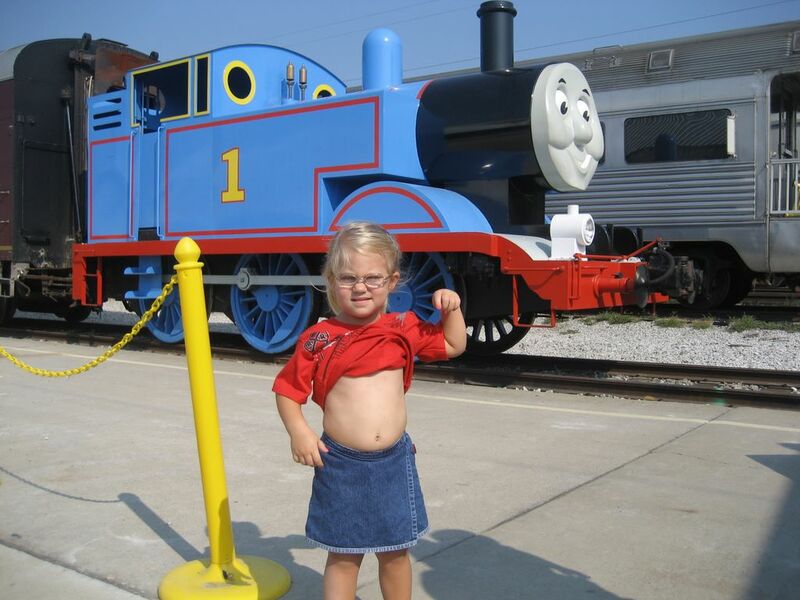 She had her heart set on Edward (turns out that’s actually a $20 train so Dad kicked in some matching funds). Here she is making her very first purchase! Just a dump of pictures from the last couple months.